To support work and carryout R & D, Relicab Cable Mfg. Pvt. Ltd. maintain a number of well designed and equipped test facilities and laboratory which enable designs and conceptions to be worked out and tested. Certified sub-standard instruments are maintained & periodic calibrations of instruments are carried out in day to day use, to ensure constant accuracy. 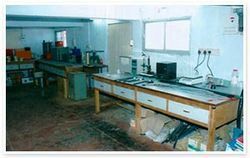 These labs & testing facilities ensure that all RELICAB products are absolutely unto the mark and to the relevant ISI international specifications. Facilities include equipment for testing, tensile strength, conductor resistance, ageing, etc. and similar mechanical properties and electrical properties such as High Voltage, spark testing Insulation etc. as well as calibration equipment for thermo-emf-curves, noise-level ratios etc. Raw materials (Copper & PVC Compound etc) which are either manufactured in-house or procured from reliable sources, are thoroughly examined for their purity and grades required. During the entire period of processing, we check for appropriate mixing of chemicals, alloys, heating temperature and dimensions etc to ensure proper tensile strength and durability. The finished products are repeatedly tested on controlled scientific conditions to verify their efficiency level. They are required to qualify on several parameters regarding connectivity, shielding, and build, fitting compatibility and speed & capacity. Our unflinching efforts and high quality products have resulted in expanding our client base, which surpassed the domestic boundary and helped us step into the international forefront. It is their repeated orders that have encouraged us in flourishing extensively. To Work on new variety of cables, specialized cables above 1.1 KV. Development of new types of Compound. We manufacture P.V.C. Compound of various varieties required for manufacturing of P.V.C. Cables. Bunching process gives the conductor a proper shape which helps us in maintaining centricity while extrusion process. The bunched conductors can give a uniform eccentricity and helps to maintain proper resistivity during its use. This binds various cores together to give a uniform layer, this helps in ensuring proper sheathing process and maintain uniform thickness all around. This process is mainly to ensure that the cable does not get corrugated when it is under earth and also it ensures that rats do not damage the cores. We invite bulk inquiries from whole sellers, distributors, retailers and other members of the supply chain. We will get back to you with complete information against all relevant queries at the earliest.